Today’s state employment report featured a new record low unemployment rate for Arkansas, 3.8%. 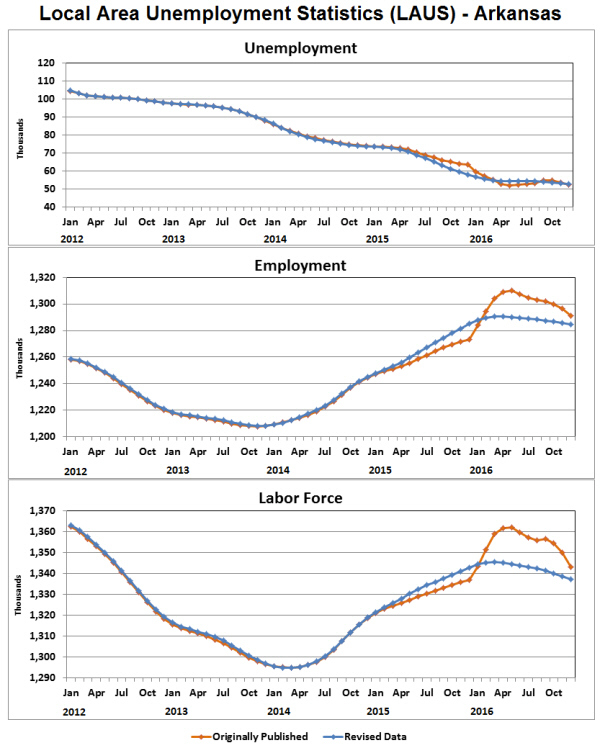 Previously published figures had shown a 3.8% unemployment rate back in May of 2016, but recent data revisions eliminated that transitory dip in the data. 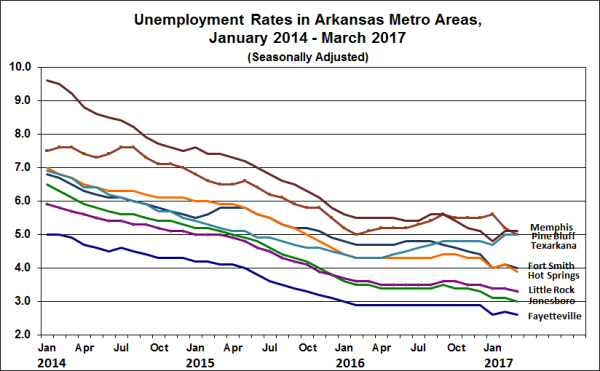 With the latest downtick, Arkansas’ unemployment rate in January was a full percentage point lower than the national average. 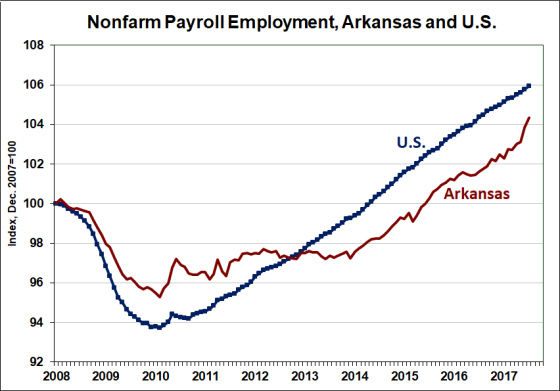 Underlying the unemployment rate itself, the number of unemployed dropped by 2,098 in January, while the number of employed increased by 823. 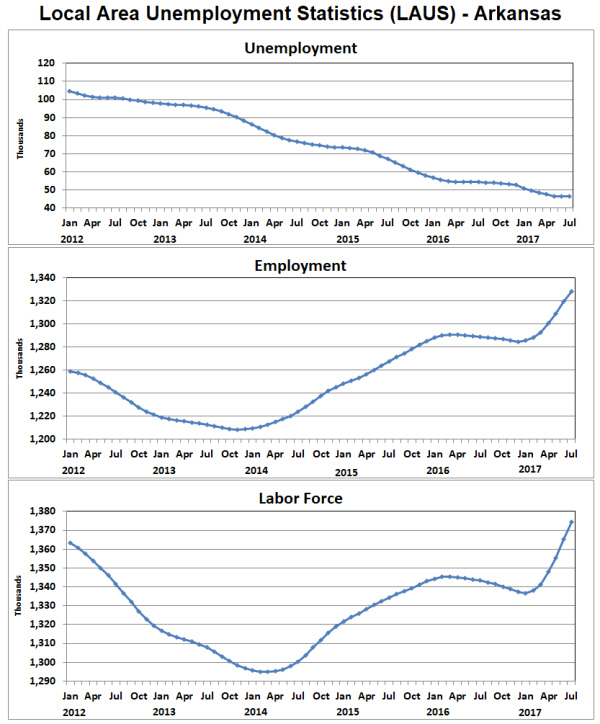 On net, therefore, the labor force contracted by 1,275 for the month. 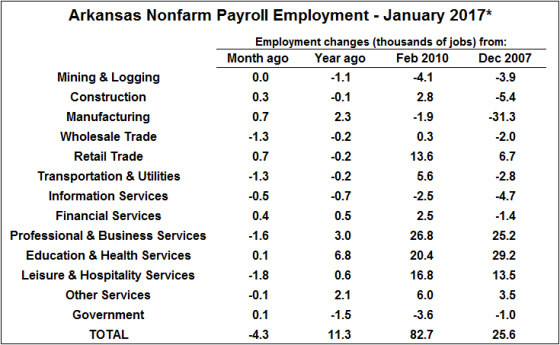 Nonfarm payroll employment declined by 4,300 in January. 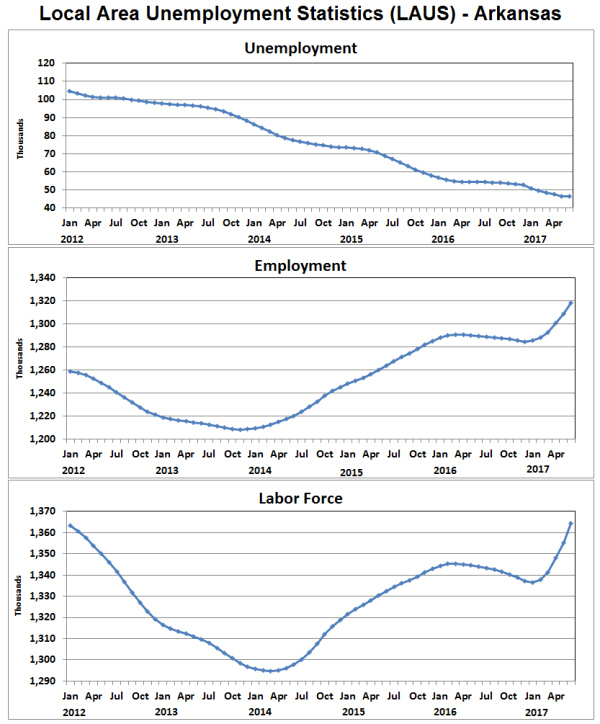 In a reversal of typical patterns, goods-producing sectors added jobs in January, while service-providing sectors shed jobs during the month. 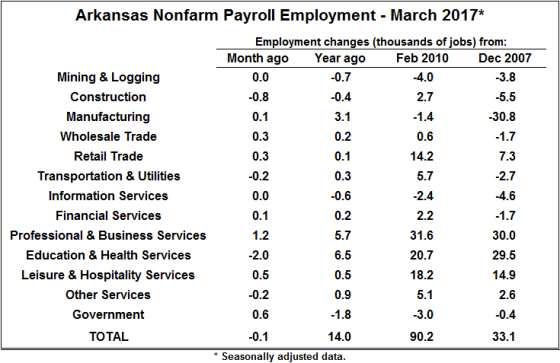 Construction and Manufacturing showed increases of 300 and 700 workers, respectively. Meanwhile, employment in service-providing sectors was down by 5,300. 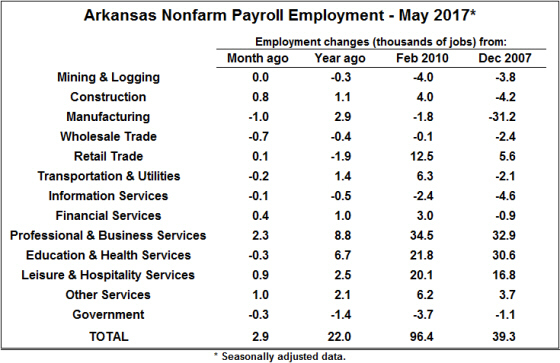 The declines were broadly based, with sectors losing jobs including Wholesale Trade, Transportation and Utilities, Information Services, Professional and Business Services, and Leisure and Hospitality. 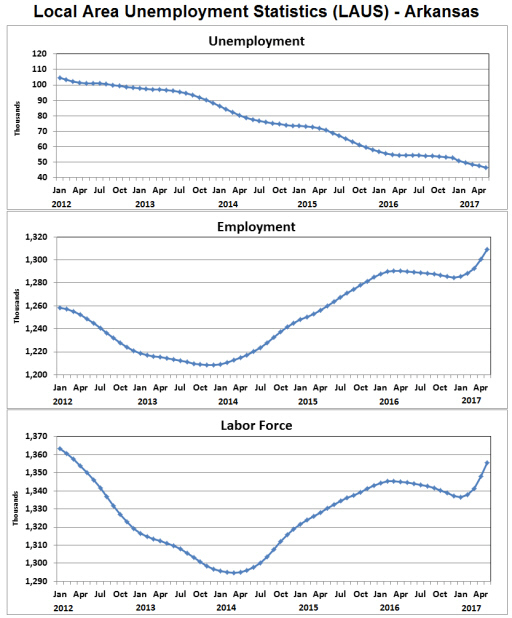 Compared to a year ago, total employment is up by 11,300. 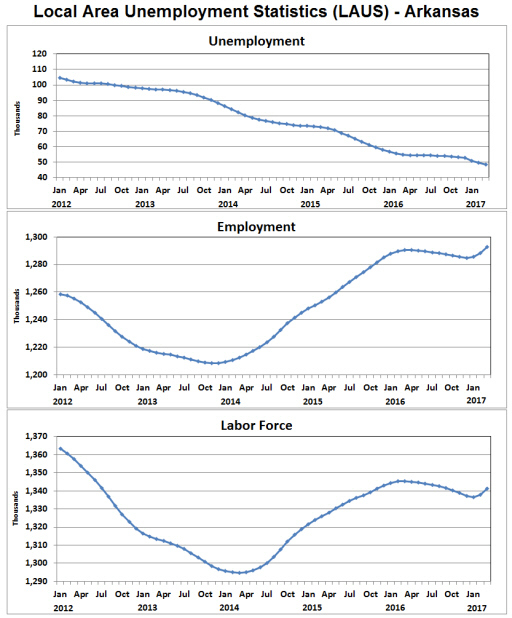 After data revisions (see below), growth in Manufacturing employment is looking more healthy, up by 2,300 over the past 12 months. The bulk of job growth is taking place in key service sectors, Education and Health Services up 6,800, Professional and business services up 300, and Other Services up 2,100. 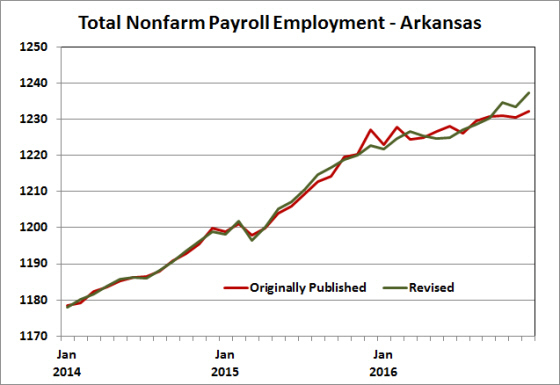 Today’s report included the annual benchmark revisions to the payroll data. 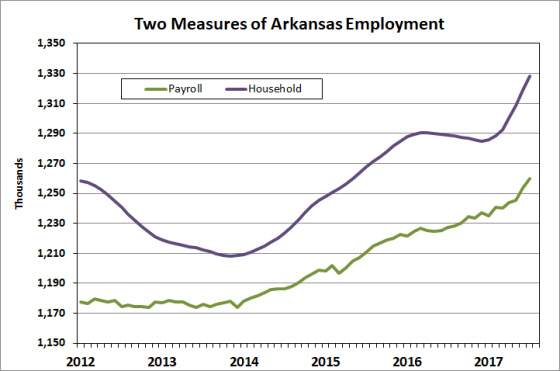 Data from the Quarterly Census of Employment and Wages (QCEW), which is more complete and accurate than the monthly payroll employment statistics, had led us to expect a modest downward revision to total employment levels for the state. However, the revised data revealed a small upward adjustment, amounting to about 800 jobs. 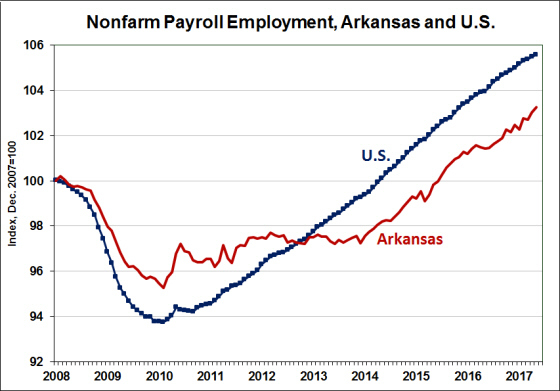 After revision, total payroll employment shows a growth rate of 1.2% from December 2015 through December 2016 (up from an original estimate of 0.4%). Growth for the previous year was revised downward slightly from 2.3% to 2.0%. Revisions to the not-seasonally adjusted data covered the period March 2015 through December 2016. Although there are small changes in the data for previous periods, these are only minor adjustments to seasonal factors. Hence, the economically significant revisions are limited to the last two years. 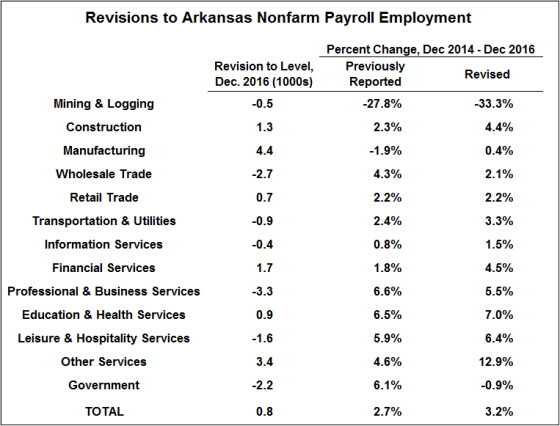 The table below summarizes the impact of the revisions by sector, reporting on the change in the level of employment by sector as of December 2016, and comparing the pre-revision to post-revision growth rates for the two-year period December 2014 to December 2016. 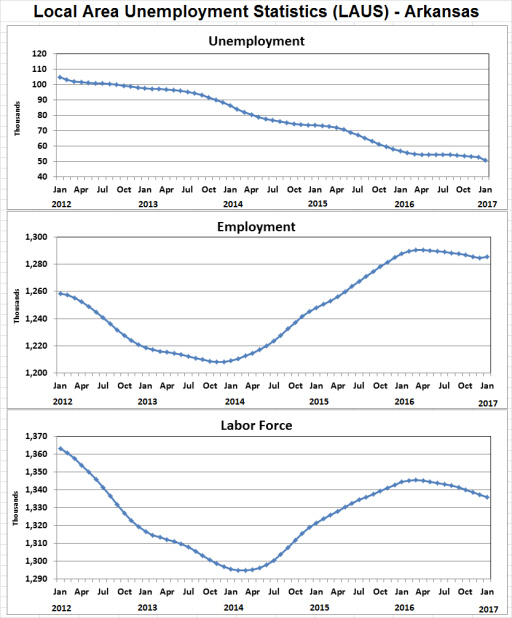 The Bureau of Labor Statistics has completed its annual review and revision of Local Area Unemployment Statistics (LAUS) for 2012-2016. The data revisions incorporate updated population controls from the U.S. Census Bureau, revisions from other original data sources, and model re-estimation. 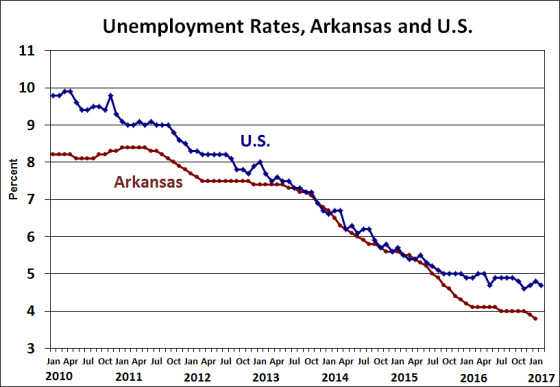 For Arkansas, the revisions were not surprising. 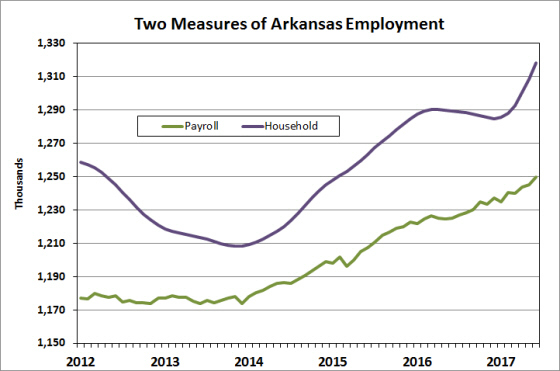 The originally published data showed a sharp increase in household employment over the first three months of 2016 — a reading about which we were very skeptical from the outset. 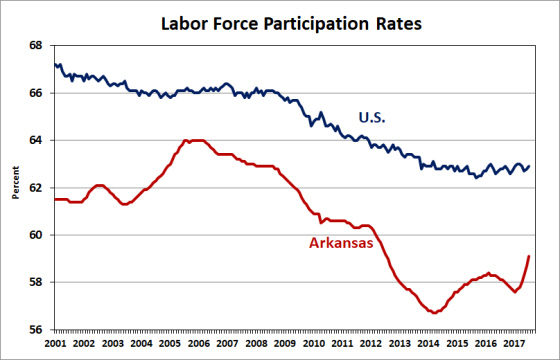 After revision, the unprecedented surge in employment and labor force was eliminated completely. 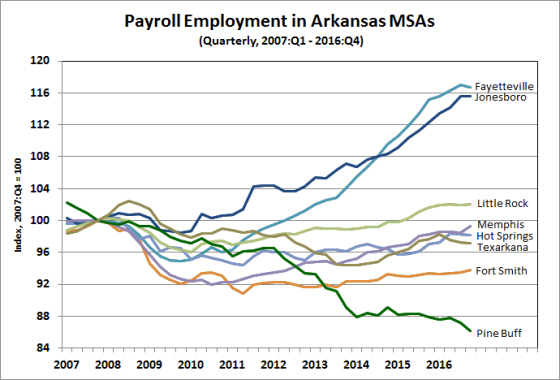 The new data show more robust growth in employment over most of 2015 and a much smaller upswing/downswing during 2016. The new data also show that the number of unemployed was lower than previously reported for much of 2015, with a smaller decline in the number of unemployed during the first part of 2016. 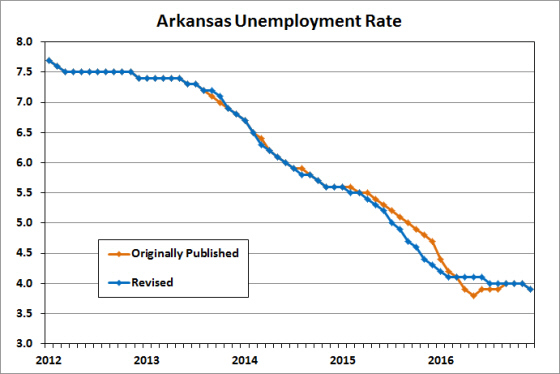 As a result of the revisions, Arkansas’ unemployment rate now shows a more rapid decline during 2015, followed by a more stable rate during 2016. 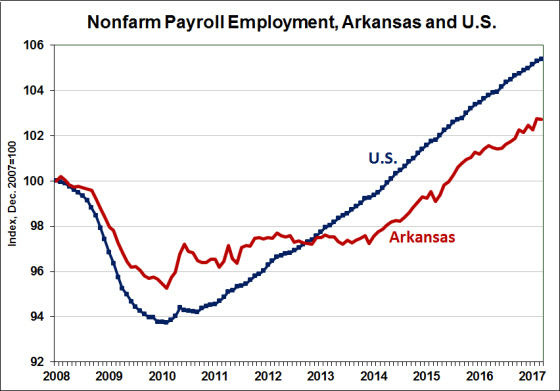 The original data had indicated that the Arkansas unemployment rate declined to as low as 3.8% in May 2016, drifting back up to 4.0% toward the end of the year. 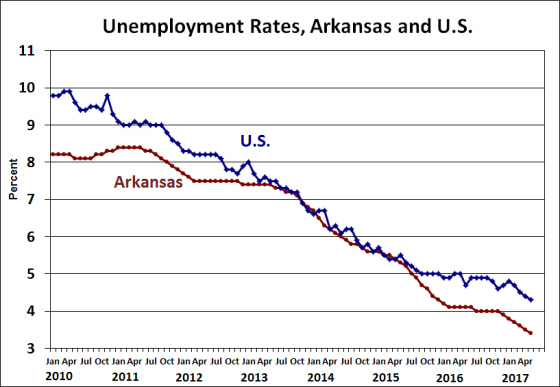 After revision, the unemployment rate changed little over the year, starting at 4.1% then dropping to 4.0% for most of the rest of the year. 1. From 2015 to 2016 (annual averages), the Arkansas unemployment rate declined 1.1%, from 5.1% to 4.0%. Massachusetts and South Carolina were the only states to show a larger decline (-1.2%). 2. 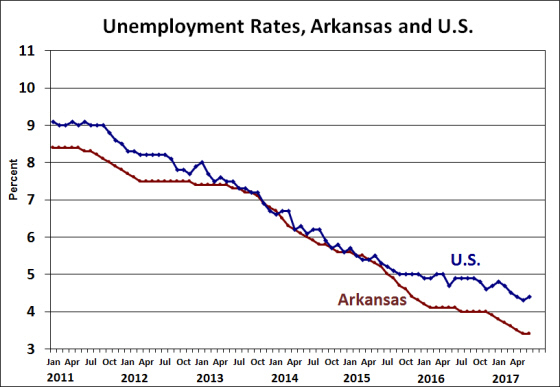 For the year, Arkansas unemployment rate of 4.0% can be considered statistically significantly lower than the U.S. average of 4.9%. 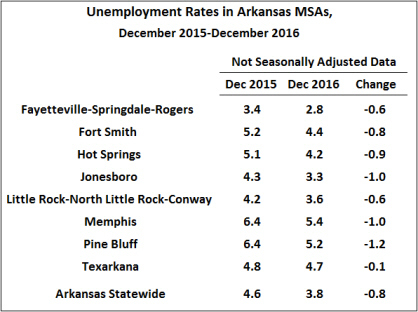 Unemployment rates in Arkansas metro areas were generally lower in December than in November. Although the raw not-seasonally adjusted figures show increases in all eight metro areas that include parts of Arkansas, the end of year is typically associated with seasonal upticks in unemployment associated with academic breaks. After seasonal adjustment, unemployment rates declined Fayetteville, Fort Smith, Jonesboro and Pine Bluff. 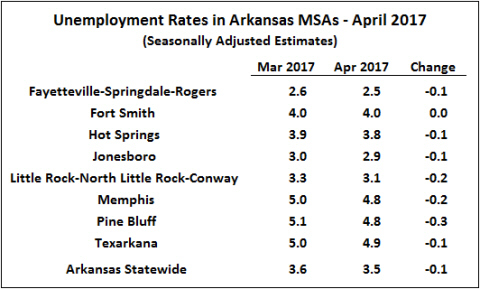 Seasonally adjusted unemployment rates were unchanged in Hot Springs and Little Rock, while increasing slightly in Memphis and Texarkana. 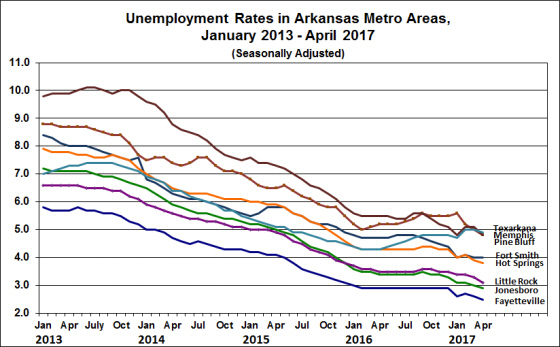 Compared to year earlier, Decembers metro unemployment rates continued to show significant declines. 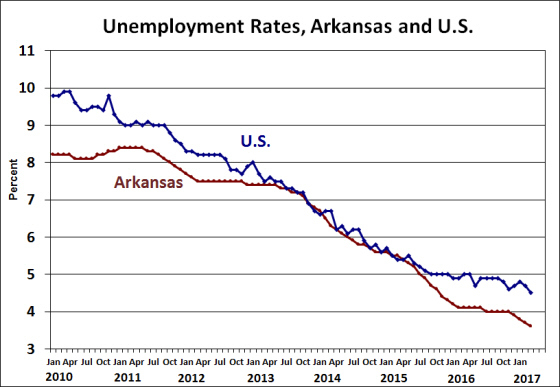 From December 2015 through December 2016, unemployment rates declined by 0.1% (Texarkana) to 1.2% (Pine Bluff). 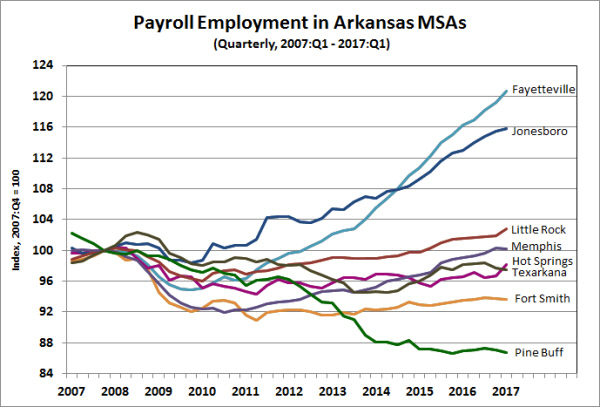 Nonfarm Payroll Employment in December was up 0.7% in Jonesboro and 0.4% in Fort Smith, but was lower in 5 of the state’s metro areas. 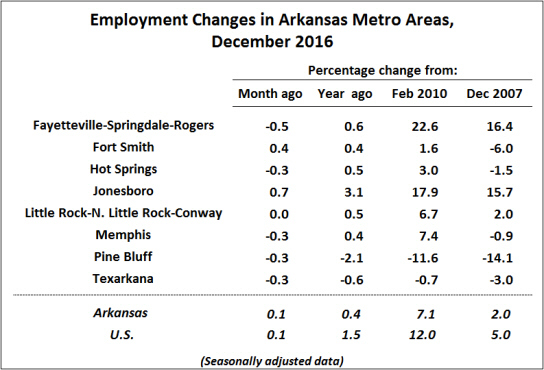 Compared to December 2015 employment was higher in most metro areas, with particularly large gains in Jonesboro. Tow metro areas, Pine Bluff and Texarkana showed year-over-year declines in employment. Those two metro areas also showed longer-term declines, with employment lower than the post-recession trough point of February 2010. 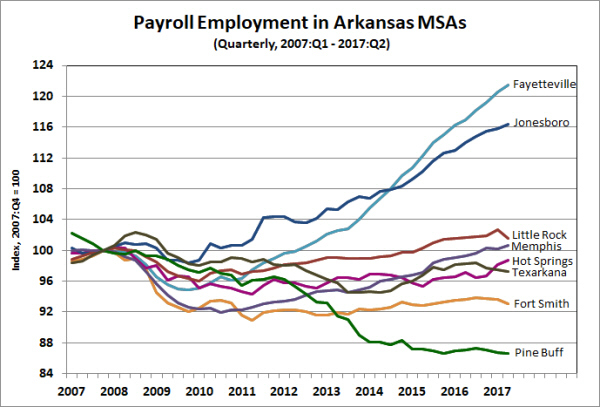 Five of the state’s eight metro areas have yet to reach pre-recession (December 2007) employment levels. 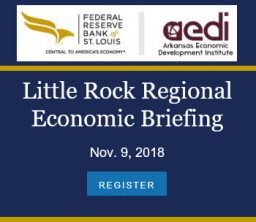 Eight years after the onset of the 2008-09 recession, only Little Rock, Fayetteville and Jonesboro have shown net gains.